Yes, it actually happened and no, no one told me about it; I learned that myself. As a matter of fact, it happened to me. 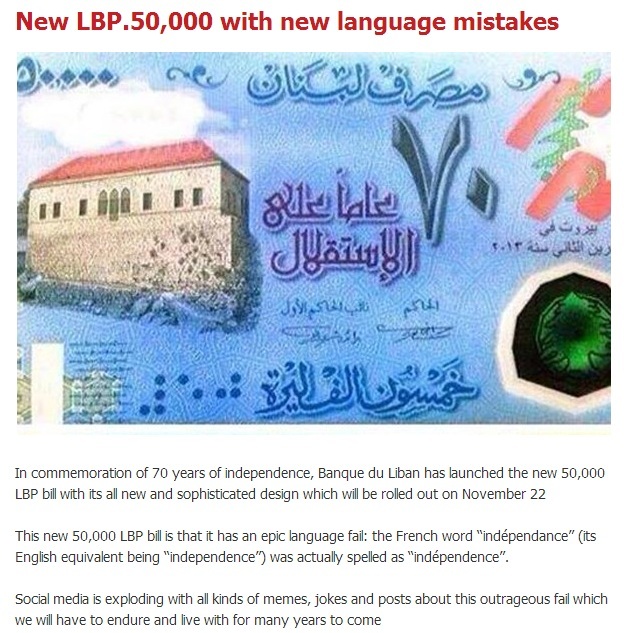 Following the outrageous statement by the Lebanese Central Bank (Banque du Liban) regarding the issuance of the new 50,000 LBP banknote commemorating 70 years of independence, which we all know by now misspells the French word “indépendance”, I had to write a post about the subject. I’m a grammar Nazi, but most importantly, I am passionate about my country and take pride in the Lebanese people’s ability to master 3 languages (Arabic, French and English). To write the post I made a little research of course and mentioned the source, which is something that every professional writer/blogger (person, for that matter) obviously does, but apparently not the personnel of MTV Lebanon. To my surprise today, I was looking up new articles regarding this subject on Google, and there pops MTV Lebanon’s article. Curious, I clicked on the link, only to find out that a few sentences of my blog post were used with absolutely mediocre alterations. Not only did the person who prepared that “robbery” make very few changes (actually, to make it look like they wrote it. Yeah. Nice try, but you failed), but they also didn’t even copy and paste correctly, and therefore the sentence became inconsistent and grammatically incorrect; not to mention that they didn’t mention the source of their info (which is my blog post)! For one of the most prominent TV channels in Lebanon, that was a really low move. MTV Lebanon, you need to create your own fresh content. You need to attract readers to your website (isn’t that why you have a website in the first place?) by writing your own material, doing some decent, professional research and giving the sources credit! How much would it cost you to hire a professional copywriter/journalist to produce professional work? Not much, given your professionalism, credibility and image are all on the line and at stake here. Wow, I’m really shocked. I would have expected that from unknown individuals, small businesses or amateur writers; but from you, MTV Lebanon? You really amazed me (in the negative sense). For readers’ reference, you’ll find below links to both my original post and MTV Lebanon’s post. They used only a couple of sentences taken from my post. After this encounter, I am really starting to think that media in Lebanon has lost all sense of professionalism. What happened to business ethics? How can they take copyright so lightly? So, before they try to use the other post I wrote as a follow up to this subject (they’ve done it before, what could stop them now? ), here is its link.